Balm for the treatment of Varicose Veins is produced using carefully selected natural ingredients from within our region. This is really important if we bear in mind that for centuries we adapted to use the local plants from which our body can gain most. Balm for treatment of Varicose Veins contains cold pressed olive oil, beeswax and plant-based wax (candellila), and 10 medicinal herbs (increased concentration of pot marigold, St. John’s wort, greater celandine, burdock, Wolf’s-foot Clubmoss, common centaury, greater plantain, yarrow, common elder, great horsetail), wild chestnut extract, lemon and lavender essential oils and propolis. phlebothrombosis (blood clot in a superficial vein. Varicose veins occur in the legs due to the highest hydrostatic pressure – the pressure that the fluid exerts on the walls of the veins. The higher the pressure, the veins are stretching more because they are retaining more blood. If there is a stoppage in the blood flow the chance to develop inflammation and form thrombi is higher. Increased risk of developing varicose veins is due to: genetic predisposition for weak vein valves (that can not resist gravity); stretchy but not elastic veins (incapable of returning to normal width), and life style (standing or sedentary with not enough of walking). o increased risk of forming thrombi (phlebothrombosis) due to the slow blood flow – because as blood flow becames reduced (same as a slow river in a wide trough) blood elements are precipitating on each other and increase the risk of coagulation and thrombus formation. Only superficial varicose veins are visible, but internal (deeper) veins can be varicose and cause all of the aforementioned conditions. 1. The most important active principle from this balm, that makes it different to all of the others, is escin from wild chestnut extract. 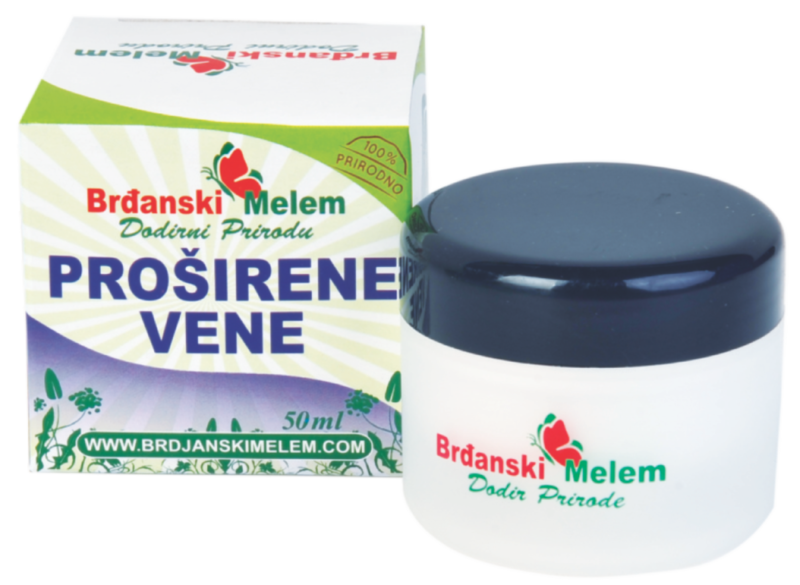 This active substance increases the long-term elasticity of the veins, causing narrowing of the veins (venotonic), and improving their healthiness by keeping their shape similar to the one in normal condition. Influence of the wild chestnut on the veins is as effective as using a compress. 2. Active principles – coumarin compounds, fraxin and esculin. From the wild chestnut extract are anticoagulants (directly reducing the potential of forming thrombus). 4. Lavender essential oil is especially accelerating epithelisation – growth of epithelium over visible (macro) and invisible (micro) skin damages. Actually, the most important is the antioxidative/anti-inflammatory effect of active principles, because oxidative stress by destroying our cells starts an inflammatory reaction. Inflammatory reaction can affect any tissue or organ. Inflammation has a protective role but if it is too strong or lasts too long, can harm more than benefit to the body due to additional damage to the already inflamed tissue. Active principles decrease oxidative stress, and in doing so, the strength of the inflammatory reaction as well, which damages veins more and more over time. Reduction of the oxidative stress eases inflammation, but in this particular case it is really important because of the reduction of the risk to form thrombi and pulmonary embolism. Once the inflammation is reduced, its symptoms subside: increased temperature of the inflamed area (color), pain (dolor), redness (rubor), swelling (tumor) and impaired function (functio laesa). Veins are still enlarged, but it is less pronounced, because they expanded due to the reduced blow flow under the influence of gravity, not because of the inflammation. Haemorrhoids develop in the same manner, except haemorrhoids are smaller veins with a bigger chance to bleed, while bigger veins, like veins of the legs, have more chance to form thrombus that can cause a life threatening condition. The most important goal is to prevent thrombus formation, preventing the stopping of blood flow and/or their inflammation. The effects of active principles are more pronounced on an applied area, but the same effects, although a bit milder, are expressed in a whole body since these substances penetrate skin and enter blood and lymph vessels. Wash your hands with soap and water. Before you apply balm, clean the desired area of the skin with lukewarm chamomile solution (tea). Dry that area by dabbing it with the clean towel. As balm is thicker than normal cream, we will explain to you how to properly apply it so you gain the maximum benefit. Camphor and 1.8-cineole are present in many preparations for inhalation for children and adults, widely available lozenges and chewing gums (mostly due to use of eucalyptus essential oil). Patients under anticoagulant and antiaggregation treatment should consult their doctors before using this balm because of the possible interactions with coumarin, fraxin and esculin from wild chestnut extract, which are anticoagulants, after long-term use. Although essential oils in our balms are present in medically safe concentrations, it is our duty to inform you about all possible contraindications and side effects. Perhaps your doctor will reduce official therapy if you are using this balm as well.